The better part of the day today was spent brainstorming with Pay It Forward Foundation president, Charley Johnson. Charley and I talked about growing our Kindness projects to students through education departments on the state and national levels. Kindness and doing kind acts for others is a cure-all for bullying. A year-long, full-time kindness program needs to play a major roll in each day of school, for every student. The Kindness Bus found its way to a semi-legal parking spot directly across from the main entrance to “Boo at the Zoo” in Salt Lake City. I stayed with The Kindness Bus to interact with crowds, take a cat-nap and to be vigilant if it needed to be move; I slept with one eye open. This evening I was invited to an 80th birthday party of the mother and mother-in-law of my overnight hosts in Salt Lake City, Wade and Leigha. How very thoughtful it was to be included in such a joyous occasion. What a very full day in this great city. The photo today is from my travels west of Salt Lake City to Elko, Nevada. 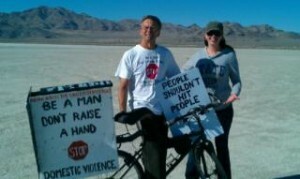 Angel took this photo of his wife Katie and me, posing with The Kindness Bicycle, on the salt flats of Nevada. Katie is in school to be a social worker to help those affected by Domestic Violence. Very serendipitous! This entry was posted on Sunday, October 30th, 2011 at 11:54 am	and is filed under Kindness. You can follow any responses to this entry through the RSS 2.0 feed. You can leave a response, or trackback from your own site. Yea for family visits and Paying it Forward with One Million Acts of Kindness. Great to connect with like minded people.